Makom Shalom’s beloved Holocaust Torah – was scribed at the turn of the 20th century and belonged to a synagogue built in 1630 in Podivin, a town on the Austrian-Czechoslovakian border. At the outbreak of World War II, the community was already quite small, and most were sent to their deaths at the Terezin concentration camp. We know of only 14 survivors of the community. This Torah was their history and their heritage; it was and is the story of the ancestors of all the Jewish People. From 1946 to 1964, this Torah resided in a synagogue basement in Prague. 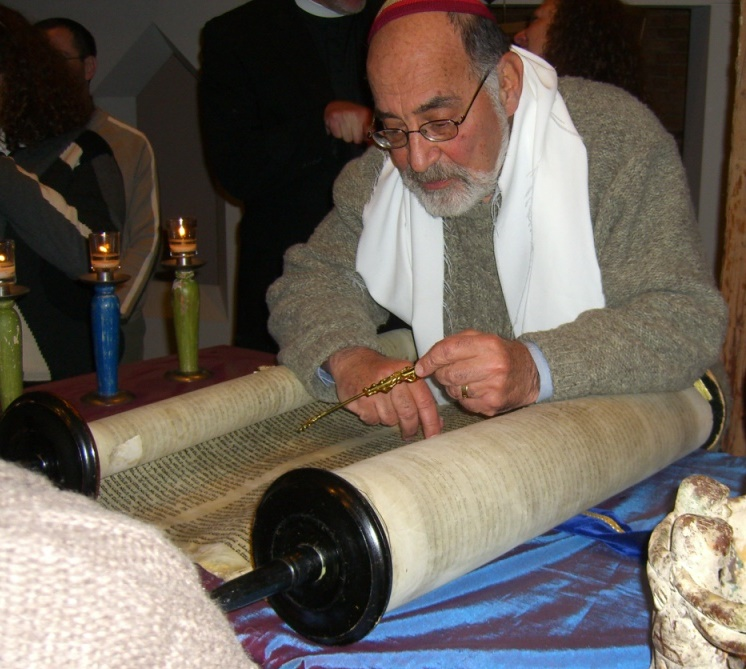 In 1964, it was one of over 1500 scrolls brought to Westminster Synagogue from the Czech Republic. In subsequent years these survivors have been distributed to Jewish communities across the globe, representing hope, survival, and faith. Our Sefer Torah, numbered MST.1499, is on long-term loan from the Memorial Scrolls Trust, London, UK. In 1996, Makom Shalom’s founding rabbi, Allen Secher, brought this Torah to Chicago. When it arrived, the Torah was joyously welcomed by a Klezmer band and a parade down Dearborn Street, beneath a beautiful chuppah. The Torah’s restoration was a community-wide effort and included donors of many different faiths. Its mantle is brown on the outside to resemble the wrapping paper it was covered in for so many years. Woven into the fabric is a worn tallit that once also covered the Torah. Embroidered hands forever hug the Torah and vibrant leaves for each donor hang from an embroidered Tree of Life. One year after its arrival, the restored Torah was dedicated, and the congregation was honored by a visit from Podovin’s last Jewish survivor. To this day, our Torah cover remains that simple brown cloth, adorned only by the tallit in which it was wrapped when it was discovered after the war. The plain brown cover reminds us to look beyond the surface when studying the Torah. It also serves as an inspiration to look beneath the surface with each other, finding the love and talent in each of us to sustain our community.